It was 18 months ago today, over breakfast with friends from Europe and Asia, that I first heard the news. A building had collapsed in Bangladesh and it was looking bad. 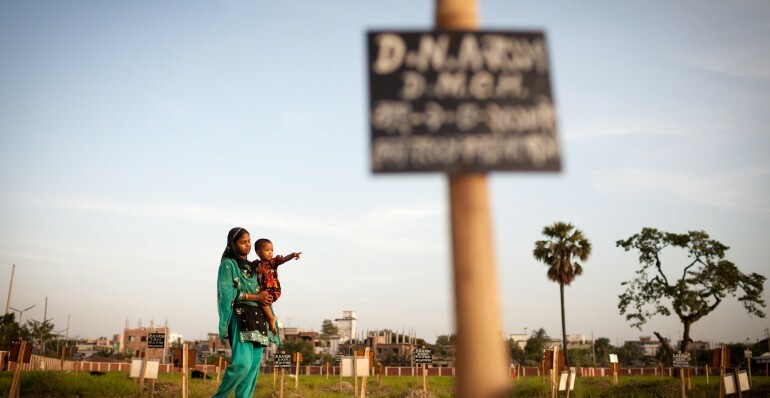 The building was Rana Plaza, and that moment changed everything. This week, the memories of that day – of those strange seconds in limbo between celebration and disaster – came flooding back as I finally made the trip to see the remains of Rana Plaza for myself. Together with Thiru Yovel, my colleague at the Clean Clothes Campaign international secretariat, I spent the morning clambering in blistering sun over the debris of a building that had once employed more than 3,000 workers. The full horror of what happened that day was evident in the bones and skeletons we found sticking up through the rubble. Primark labels littered the ground along with fabric rolls and torn-up clothes. Groups of kids helped us to dig out more labels, more bones and more scraps of clothing. They pointed out the remains of a staircase and holes in the wall next door – now repaired – that were punched through by rescue workers desperate to reach the screaming victims. As we looked around, my stomach churned with the knowledge of what had taken place that day; it was under this rubble that so many people died. The numerous projects that sprang up in response to the disaster have had little impact on this community. Wherever the money went, little of it made it to them. Some help has arrived, but it is so haphazard that no one knows where it came from, or why some people got it while others didn’t. One woman we met was provided with stock to enable her to set up a small shop; she knew only that someone who was at the hospital had given it to her. This kind of charity – well-intentioned but lacking transparency – is not enough. These workers need compensation, and they need it quickly. Everyone told us they had received the initial compensation paid through the Rana Plaza Donors Trust Fund in April and we hope that, by the end of November, everyone will have received their first instalment of compensation. This may ease their burden for a while, but they urgently need the full payments they are owed in order to start again. When we opened the Rana Plaza fund last March, I genuinely believed we would get the money quickly. After all, many brands produced their wares at Rana Plaza. Many could have paid the whole amount outright without so much as a blip in their profits. But this hasn’t happened: to date, less than half the money needed has been donated. Benetton hasn’t paid a penny into the compensation fund. Others, including Mango, Matalan, Walmart and its British subsidiary, Asda, have made payments so small that they are an insult to these families. 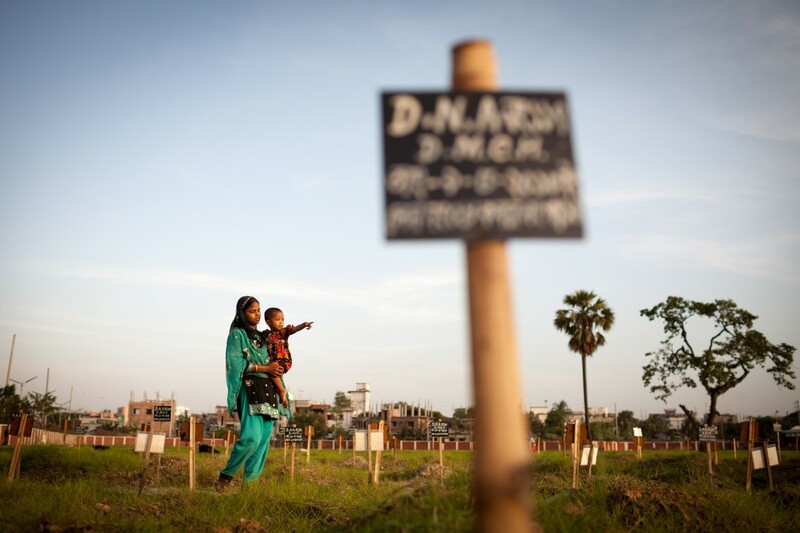 The survivors and families of Rana Plaza have been failed by everyone. Their government, their employers, the brands and, yes, even us – the consumers. As long as our response to such tragedy is to wring our hands in guilt, to worry about our choices and how we can feel good about the clothes we buy, we will continue to fail them. As much as we may want to, we can’t shop ourselves out of this. If we really want a fashion revolution, we have to do more. We have to stand with these workers and shout as loud as we can, so that they will not be forgotten and will not be left alone. We have to keep fighting, however long it takes, until the workers of Rana Plaza receive every penny of compensation they are owed. This is the least they deserve. By Sam Maher, policy director of worker safety at Labour Behind the Label for The Guardian, October 2014.